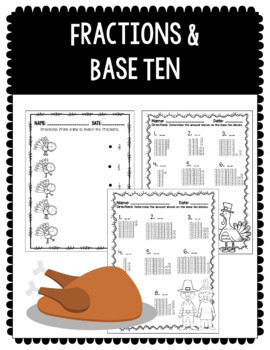 This purchase includes Thanksgiving themed morning work perfect for K-2. 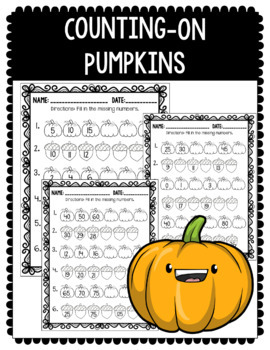 Counting-on Pumpkins: Students fill in missing numbers by counting on forwards and backwards by 1s, 2s, 5s, and 10s. 3 variations included. Missing Beginning and End Sounds: Students identify missing beginning and ending sounds of Thanksgiving items. 2 variations included. 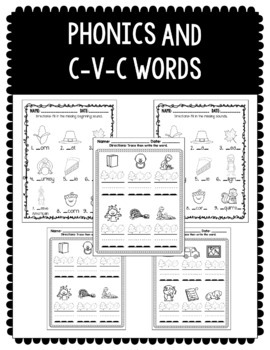 CVC Leaves: Students fill in CVC words by tracing letters and then copying. 3 variations included with copying and 2 variations included with missing vowel. Fraction match: Students match fractions to visual representations. 1 variation included. Base-Ten Calculations: Students calculate base ten values. 2 variations included.